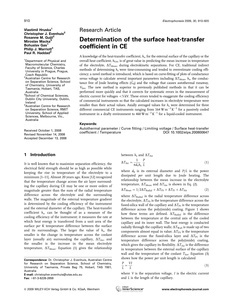 A knowledge of the heat-transfer coefficient, hs, for the external surface of the capillary or the overall heat coefficient, hOA, is of great value in predicting the mean increase in temperature of the electrolyte, TMean, during electrokinetic separations. For CE, traditional indirect methods of determining hs were time-consuming and tended to overestimate cooling efficiency; a novel method is introduced, which is based on curve-fitting of plots of conductance versus voltage to calculate several important parameters including TMean, hs, the conductance free of Joule heating effects (G0) and the voltage that causes autothermal runaway, Vlim. The new method is superior to previously published methods in that it can be performed more quickly and that it corrects for systematic errors in the measurement of electric current for voltages <5 kV. These errors tended to exaggerate the cooling efficiency of commercial instruments so that the calculated increases in electrolyte temperature were smaller than their actual values. Axially averaged values for hs were determined for three different commercial CE instruments ranging from 164 W m-2 K-1 for a passively cooled instrument in a drafty environment to 460 W m-2 K-1 for a liquid-cooled instrument.